Scientific degree: Doctor of Biological Sciences. Biography. V. Harbuzova graduated with honors from Sumy State A. S. Makarenko Pedagogical Institute. In 2004, she received the Candidate of Biology academic degree (specialty 03.00.13 – Human and animal physiology) on the theme "The experimental data on the role of lipid peroxidation in the development of calcification of blood vessels caused by hypervitaminosis D" (scientific supervisor – Dr. Med. Sciences, prof. O. V. Ataman). 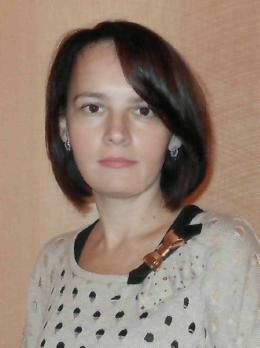 In 2013, she received the Doctor of Biology academic degree (specialty 14.03.04 – Pathological Physiology) on the theme "The Role of matrix Gla-protein (MGP) in the development of arterial sclerotic lesions and their complications (experimental and molecular genetic studies" (scientific consultant – Dr. med. sciences, professor O. V. Ataman). She is Deputy Director of the Medical Institute with educational and methodological work. Since 2011 she is the Head of the Laboratory of molecular genetic investigation (see here). Awards. Diploma of the Ministry of Education and Science of Ukraine (2001 and 2011) for the fruitful work with gifted students. Research interests: mechanisms of calcification of blood vessels, the role of allelic polymorphisms of genes in the development of cardiovascular diseases.